A gentleman by the name of Wally Conron was the man behind the breed. In the late 80s, Mr. Conron worked as a puppy-breeding manager for the Royal Guide Dog Association of Australia. He received a request from a vision-impaired woman in Hawaii for an allergy-free guide-dog since her husband was allergic to dog hair. His goal was to produce a non-shedding guide dog by using a Labrador Retriever and a Standard Poodle. The result of crossing these two beautiful dogs produced intelligent, extremely low to non-shedding, easily trainable puppies that were the beginning of the Labradoodle as we now know it. 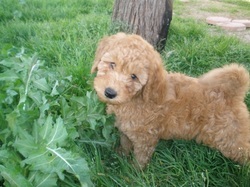 To read more on the story, please visit The Australian Labradoodle Association of America website at www.ilainc.com. The Labradoodle coat can vary from very curly to slightly wavy or even straight. This very curly coat is called “Wool.” The wavy coat is called “Fleece,” and the straight coat is very similar to that of the Labrador and is called “Hair.” The color of the Labradoodle can vary as well. Colors include chocolate, chalk, apricot, cream, cafe, black, silver, and parti-colored. Both the coat coloring and texture will depend on the parents. Tails of the West Labradoodles offer Medium Authentic Multi-Gen Labradoodles. Multi-gen labradoodle technically means a dog resulting from a litter where both parents were at least F1B generation or beyond. 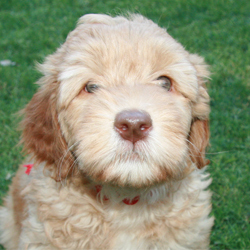 The term “Australian Labradoodles” means that there are lines of multigeneration Labradoodles with long and specific pedigrees, some originating in Australia.